In real estate, it is said, the three most important factors are location, location, and location. What if you’ve found a home that is in a prime location, but the property itself is not in such good shape? This is going to become a more common phenomenon, as more and more foreclosures come onto the market. Many of these homes were once nice places in good locations, but as money problems increased, the mortgagee often neglected repairs and upkeep. As you may know, there are government grants for home repair, but they would not ordinarily be offered in the case of property you haven’t bought yet, or that you bought in poor repair. These government grants often are disbursed to income-qualified or elderly people who have been in a home for a while, but it has fallen into disrepair over time. In the past, when mortgage lending was more freewheeling, you could have just taken out a mortgage for the home’s current value, then a second mortgage to cover the repairs, even though the current value of the unrepaired home would not have covered the combined amount. The attitude was that, in a rapidly appreciating market, the home value would soon enough catch up. However, a lot of private lenders got burned with second mortgages when the housing market took a downward turn, and they’re in no hurry to offer them again. Today, mortgages generally will not be approved for more than the home’s current value, so that leaves the home buyer stuck with no good way to finance the needed repairs. An exception to this is places that are slated for urban renewal and neighborhood revitalization, where there may be government grant money to subsidize the purchase plus repair. Government grants are being used in this case to expand available housing, remove blight, and address the problem of crime occurring around unoccupied or abandoned housing. Another advantage is that it builds up the property tax base, although there are sometimes additional government grants that subsidize the first couple of years of property taxes, to further encourage revitalization. But if you have your eye on a property that’s a fixer-upper in an area that’s otherwise already in good shape, is there any help for you? Fortunately, the Federal Housing Administration (FHA) offers future value financing in its Section 203(k) program. Here’s how it works. The property appraisal includes both a present-value assessment, plus a future-value estimate, based on the home value once the repairs have been done. 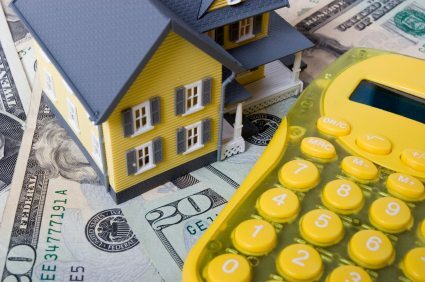 If the mortgage is approved, it’s a single mortgage that has a dollar amount based on the future value of the home. Although the money is repaid, this amounts to a type of government grant because money is allocated by a federal agency to fulfill a housing need that the private sector wouldn’t consider funding. The FHA is essentially taking a gamble that the home buyer will perform the repairs as agreed. They consequently have several safeguards in place to see that the rehabilitation does get carried out. First, before the mortgage is insured, the lender is required to create a rehabilitation escrow account that contains the money allocated for expenses. Draws against this account are accounted for throughout the repair process. If the repair amount is going to exceed $35,000 then the FHA even assigns a Department of Housing and Urban Development (HUD)-approved consultant to oversee the process. The consultant monitors the rehab work and prepares the required architectural exhibits, in addition to other duties. The consultant charges a fee, but it can be rolled into the mortgage amount. As homes age and the housing market continues shedding marginal borrowers, there will likely be an upsurge in the 203(k) program. With its continued success, more government grant may be allocated to it. Keep in mind, too, that in addition to funding new home purchases, this program is also available to existing homeowners who want to rehabilitate their properties through a refinance. This is another good use of government grant funding because it helps ensure the continued safety and comfort of long-term homeowners. There’s value in established, stable neighborhoods, and the 203(k) program can help with the upkeep of the homes. In transitioning neighborhoods too, the 203(k) program plus government grants, can be the key to revitalization.